In a sense, Jim & Andy is this standard industry documentary, telling the story of how an actor was inspired to give another industry figure an in memoriam by way of biopic. It is the type of biopic that dissects an industry treasure that has disappeared from the industry for a while. Carrey describes that his comic persona is a Hyde figure that comes out once he is in front of a microphone and an audience full of people. This all reads like standard industry documentary stuff. And, yeah, at first it reads pretty pretentious. But there is another layer to Jim & Andy, and it is a layer that Kaufman would be proud of. In archival documentary footage from almost 20 years ago, we see Carrey go full Daniel Day-Lewis on his role in Man on the Moon. In one painfully clear sense, Carrey in this role is an on-set menace. As such, it is somewhat imbalanced that the film focuses all of its narrative attention on Carrey’s retrospective reminiscing of the events. There are scenes where one sympathizes, to no end, with Forman’s struggle to rein in Carrey’s manic, disassociated persona. In a different sense, this struggle and lopsided focus makes for entertaining spectacle. At one point, Man on the Moon co-star Danny DeVito says to Forman, after Carrey goes loose on another actor on set: “What are we gonna do?” That is the documentary in a nutshell. Carrey loses himself in the role to the point where it becomes surprising that Man on the Moon was made and released at all, and the events are narrated by him in a way that makes it all feel transcendent somehow. On its face, this is highly entertaining. Carrey’s wacky antics get him into trouble and incite incident that was thankfully put to film. It is unprofessional, detrimental to the film production, and makes you fear for Carrey’s mental health circa 1998. But it is also hilarious, surreal, and as strange as Kaufman would have wanted. 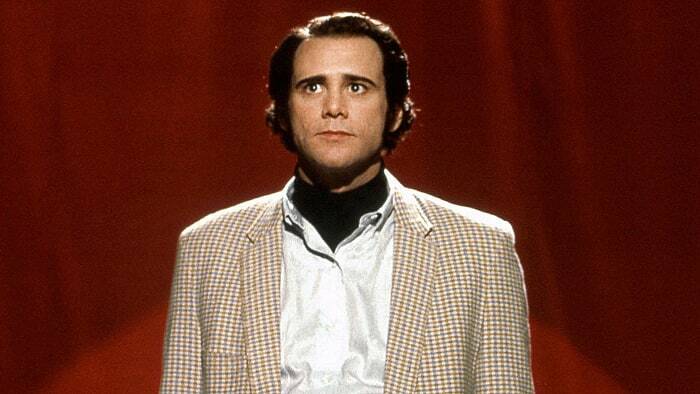 Just as Carrey slipped into the roles of Andy Kaufman and Tony Clifton, he refers back on the production of Man on the Moon as if those people were really doing the roles instead of him. In a few moments, however, Carrey bubbles to the surface and opens up in genuine and revealing ways. Otherwise, it feels like he is coloring past events in ways that make him appear righteous. If Jim & Andy is Jim Carrey reshaping his disastrous antics in a way that is artistic and revelatory, then director Chris Smith provides a convincing argument. It is hard to sell this movie on the fact that Carrey’s is the sole voice narrating the events, but Smith makes it feel inspiring, almost poetic. Carrey, who is looking back on both his own long-standing career and that of perhaps his greatest inspiration, has a wealth of soft-spoken knowledge to convey about the creative process and what inspires it. Jim Carrey is a performer. He always has been. Would it have been more insightful to hear what other folks involved in the Man on the Moon production thought of Carrey’s on-set antics? Sure. But Jim & Andy links the two eponymous names in a way that is intriguing and inspiring. The most genuine and ineloquent moment of the film is Carrey’s final line, and it sums it up as good as any ending could: “Wow, we got into some crazy s**t there, man.” Because, really, that’s all there is to it.